and steelhead in the Columbia River Basin is permanently blocked by dams. Dams impact salmon and steelhead in a number of ways, from inundating spawning areas to changing historic river flow patterns and raising water temperatures. Dams block passage of salmon and steelhead between spawning and rearing habitat and the Pacific Ocean. Where fish passage is not provided the blockage is permanent. More than 55 percent of the spawning and rearing habitat once available to salmon and steelhead in the Columbia River Basin is permanently blocked by dams. Dams also altered habitat by creating reservoirs. Inundation of shoreline areas in some parts of the Columbia River Basin, the John Day Reach of the Columbia and Hells Canyon of the Snake River, for example, wiped out historically productive spawning habitat for fall Chinook salmon. Reservoirs also slow the flow of water and, through insolation, can cause its temperature to rise to levels that are lethal to salmon and steelhead. Dams also changed the food web in rivers by impounding reservoirs, as well as by altering the ecology downriver of dams through, for example, changes in sediment transport. By altering historic river flow patterns dam operations also led to changes in the Columbia River plume into the ocean, an important rearing area for juvenile salmon and steelhead. In the Hanford Reach of the Columbia, the most productive, and natural, fall Chinook spawning habitat remaining in the Columbia River Basin, water levels are affected by water releases from Priest Rapids Dam immediately upstream. As the water rises and falls with power generation at the dam, egg nests (redds) and newly hatched juvenile salmon can be stranded as water floods and then retreats from shoreline areas. Not until the 1990s did fishery and utility officials devise an agreement to regulate outflows from the dam, and others upstream, to protect the fish. These are not all recent impacts, and the impacts are not limited to those from hydroelectric dams. The impacts of dams on salmon and steelhead began practically as soon as the first dams were constructed. Between 1880 and 1910, for example, loggers built 56 splash dams in the western Washington portion of the Columbia River Basin, and 55 more in the Willamette and Deschutes watersheds of Oregon. Splash dams were nothing more than piles of logs that backed up small, temporary reservoirs on tributary streams of a larger river. Once a pool formed behind a splash dam, more logs would be dropped into the pool and, when it was full, the dam would be dynamited and the logs and water would sluice down the tributary to the main river and be floated to sawmills. Splash dams brutalized many salmon and steelhead spawning streams. Other tributary dams wiped out salmon runs long before mainstem Columbia and Snake river hydropower dams were built. In 1915 Long Lake Dam, with no fish ladder, was completed on the Spokane River four miles above Little Falls Dam (completed in 1911), effectively ending salmon and steelhead passage some 30 years before Grand Coulee Dam would finish off Spokane River salmon and all other upriver anadromous stocks. Spokane River settler D.L. McDonald later wrote: "It was a sad day for the settlers who had grown to depend on the salmon as one of their staple foods. But for the Indians, it was a catastrophe." Although dams were known to impact salmon, few dams ever were removed. One of the first, if not the first, to be removed over salmon impacts was one across the Wallowa River in northeastern Oregon. The dam was constructed in 1904 at the Minam Fish Hatchery, and on June 4, 1914, in a late-season snow storm, the dam was dynamited. The dam had been in place since 1905, when it was constructed with the hatchery to trap salmon returning to spawn. Eggs from Wallowa River salmon were incubated and the smolts released from the Bonneville Fish Hatchery at Eagle Creek to feed the commercial fishing industry, but the dam had decimated the Wallowa River fishery. Two weeks after the dam was blown out, the Wallowa County Chieftain newspaper of Enterprise, Oregon, reported: "It is hoped that the removal of the dam, by opening the river to migratory fish, will make angling better than ever in streams and lakes of this county." But the hope never was realized. By then, sockeye in Wallowa Lake had lost their migratory instinct and become adapted to the lake environment. Three years later, when a screen at the outlet of Wallowa Lake was removed to allow an estimated 5 million fish to migrate to the ocean, most of the fish later were discovered in irrigation ditches short distances downstream. Ironically, another dam was built at the outlet of Wallowa Lake just four years later, in 1918, and it, too, stopped fish passage. The elevation of the privately owned dam was raised in 1929. The 35-foot-tall concrete dam, which lacks fish passage, is owned today by the Associated Ditch Companies, Inc., a non-profit corporation. In 2000 the Oregon Water Resources Department declared the aging structure a "high hazard dam," which meant it could be condemned if it is not rehabilitated. Associated Ditch Companies sought funding for the needed repairs, which could include fish passage facilities to allow coho and sockeye salmon to migrate freely into and out of the lake, something the fish were not able to do for most of the 20th century. 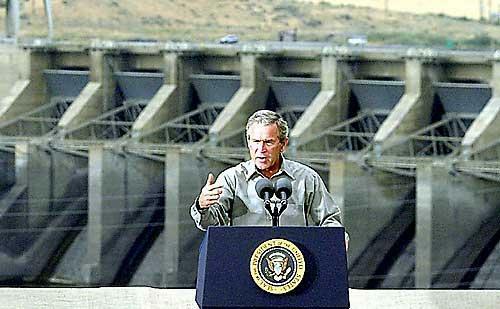 State and federal money was appropriated in 2006 for rehabilitating the dam. In 1927, Inland Power and Light Company completed Lewiston Dam on the Clearwater River four miles upstream from its confluence with the Snake. The dam included a fish ladder, but it was inadequate. Lewiston Dam virtually eliminated Chinook salmon runs into the Clearwater Basin. Steelhead were able to negotiate the ladder, but their numbers declined dramatically, too. In 1937, Washington Water Power Company of Spokane acquired the dam, and in 1939 built two additional fish ladders. Improvements were made to all three ladders in the mid-1960s. Lewiston Dam was removed in 1973 to make way for the reservoir behind Lower Granite Dam about 40 miles downstream on the Snake, and also to facilitate barge traffic to Lewiston. In May 1999, a federal judge approved a settlement that required Avista Corp., formerly Washington Water Power, to pay $39 million to the Nez Perce Tribe for fish losses caused by Lewiston Dam and another dam that also was owned by Avista's predecessor. That one, the Grangeville Dam, was built by Grangeville Power and Light Company in 1903 and also was acquired by Washington Water Power in 1937. Grangeville Dam operated until 1963, when it was demolished. Dams not only block passage of adult fish, dams block downstream passage of juvenile fish. At hydroelectric dams the problem is compounded because in the absence of bypass systems, the juvenile fish must go through the turbines. The problem of adult fish passage was addressed through the installation of fish ladders, and these have proven to be effective. When Bonneville Dam was completed in 1938, its fish ladder, which climbs more than 70 feet, was one of the highest in the world. Over the years, at Bonneville and at other dams, adult fish that climb the ladders occasionally are swept back through the turbines by the strength of the current. But these losses are minor in comparison to the slaughter of downstream-migrating juvenile fish. The fish-passage problem was not unknown in the 1930s. On March 19, 1934, Congress passed the Fish and Wildlife Coordination Act (amended in 1946 and 1958), which required the federal government to take fish and wildlife into consideration in the planning of federal water development projects. It was the beginning of efforts to mitigate the impact of federal Snake and Columbia River dams on fish and wildlife (over time, planning continued with a main control plan for the Columbia River in 1945, a document known as HD531, and a major water plan in 1962, HD 403). In 1938, the primary way juvenile fish passed Bonneville Dam was through the turbines. At the time, fish researchers considered turbine passage safe; fish also could pass when spillway gates were opened, as they were from time to time to allow excess water to pass, and the dam included four small fish ladders especially for juvenile fish. But as historian William Willingham has written, biologists greatly underestimated the problems of downstream fish migration. The problem is one of size -- juvenile salmon and steelhead range from two inches to six inches in length, depending on the species. Inside the turbines, they are very small fish in a very large and dangerous place. Bonneville, like most of the dams on the Columbia and Snake rivers, uses the Kaplan-style turbine. Kaplan turbines utilize a propeller, called a "runner," that sits in an individual concrete pit and is spun by water passing through the pit. Some dams -- the Third Powerhouse at Grand Coulee, for example -- use Francis turbines, which look more like giant salad spinners. Imagine the basket spinning as water enters from the side, controlled by vertical gates. Typically, Francis turbines are used at dams where the head -- the distance the water falls to the turbine -- is greater than 100 feet, which is not the case at Bonneville. In either design, the upstream entrance to the turbine pit is higher than the downstream exit, and so water falls through the pit and spins the runner, which is connected by a shaft to a turbine below. At Bonneville, the runners look like huge boat propellers and have five blades (all of the other federal dams in the Columbia Basin that use Kaplan turbines have six-bladed runners, as they are higher dams that can generate more water pressure to spin the heavier units). Each Kaplan blade is about 12 feet across and weighs about 20,000 pounds. The entire assembly, including the shaft and five blades, weighs about 120 tons. Spinning at just under 80 revolutions per minute -- or whatever velocity produces electricity at the standard 60 cycles per second -- the runners create tremendous water pressures. In fact, the pressure is so great that it can peel bits of steel off the undersides of the blades in a process called cavitation. Juvenile fish that are drawn into the turbine pits by the current can be killed or injured. Usually these mortalities or injuries are caused when the fish strike the spinning blades or the concrete walls. The intense water pressure also can kill the fish. Biologists estimate that if turbine passage is the only way past a dam, 10 to 15 percent of the fish that are drawn through the turbines will die. With that much mortality at least possible at each dam, fish that pass multiple dams, such as fish from central Washington or the Snake River, have a statistically high probability of dying before they pass the last dam, Bonneville. By the 1940s, Columbia River salmon runs were in serious decline. There were many causes -- harvest in the lower river took a huge toll between about 1880 and 1910, for example -- but the multiple impacts of dams were key among them: warmer water, slower flows, ineffective fish passage and, at hydroelectric dams, the spinning turbine blades and intense water pressure in the turbine pits that could literally implode the tiny juvenile fish, although the mortality associated with turbine passage would not be clear until research began to prove it in the early 1950s. Following World War II government river planners faced intense pressure to step up construction of dams in order to provide more power for industry. Fish and wildlife agencies were under pressure to provide more salmon from hatcheries to boost the commercial fishery, an important economic activity. Dams were seen as good for the economy and bad for salmon, but salmon were seen as good for the economy, too. So what would it be? Dams or salmon, or, in what would prove to be essentially an impossible compromise, dams and salmon? In 1946, for example, one year after Congress authorized construction of "such dams as are necessary" to provide slackwater on the lower Snake River to improve conditions for navigation and barge traffic, the question was how many dams. Four dams between Lewiston and the mouth of the river appeared to be the optimum number for hydroelectricity production, considering the drop of the river in that distance, but each would require 100-foot lift locks, the highest ever constructed. Some engineers suggested as many as 10 dams in order to make for lower lifts. But fish advocates worried. In a letter to the Corps dated Nov. 25, 1946, James O. Beck, director of the Idaho Department of Fish and Game, made it clear that the ideal number of dams was zero. "After giving thought to the many problems involved," Beck wrote, "we feel that possibly less harm may be done by the four-dam plan [although] this letter is in no way intended as an endorsement ... for construction of [any] dams in the Snake River." Outside the scientific and environmental community, however, it was widely believed that dams had no real impacts on fish. In the decade following World War II, the Northwest economy continued to improve despite the predictions of some observers that the return of peace would mean lost jobs at shipyards, aluminum smelters, and aircraft plants. It didn't happen, and in fact economic and industrial growth continued steadily in the Northwest until 1952. Natural resources continued to be the focus of the region's manufacturing industries, and steps were taken to maintain the resource base. Management of resources became more important in key industries like forest products and fisheries. Inexpensive hydropower gave the region an advantage in attracting new industries, but the impacts of dams on salmon were not well understood. In some popular literature, in fact, dams were touted as fish-friendly. In 1946, author Julie Crandall proposed in her book, The Story of Pacific Salmon, that juvenile salmon and steelhead are too small to be injured by turbines: "If the turbine does not turn faster than seventy-five times per minute practically no harm is done to the fish, since they are so small and can dart through so swiftly." She went on to report that some biologists of the time were hopeful that improved conditions in spawning areas and at hatcheries would boost the number of fish, but she also noted that ". . .others predict, pointing to other rivers as examples, the gradual disappearance of salmon from the river as civilized man meddles more and more with the natural patterns of fish life." The same year, 1946, the vice president of the Columbia River Development League, Frank Bell, a former U.S. Commissioner of Fisheries, said turbine passage at Bonneville Dam appeared only to leave juvenile fish "groggy." Nonetheless, public concern about the impacts of dams on salmon was growing. In 1948, author Murray Morgan expressed this concern in a book about the Columbia and dams: :"The [salmon life cycle] is centuries old. This may be its last century. The dams men set in place across the Columbia may end the run. The fish cannot jump over the dams. The strongest Chinook cannot leap the monolithic barricades." Were dams benign or not? Was it reasonable to build more dams and then find out? Or should the matter be studied more fully first? Should exploitation of river water for hydropower take precedence over preserving suitable river conditions for conservation of salmon and steelhead? Although the conditions at Bonneville Dam and at the Snake River dams may be dissimilar in some features, in view of the experience of the functioning fish facilities at Bonneville Dam, this office still is of the opinion that the Snake River Dams will not eliminate the runs of migratory fish on that stream. Also in 1947, the Columbia Basin Interagency Committee, which had a number of responsibilities including coordinating federal interagency and state interests in Columbia River development, conducted an important public hearing on the question of whether dam construction on the lower Snake should be postponed. The issue before the committee was whether to support a moratorium on construction until there was some assurance that the dams would have effective passage facilities for salmon and steelhead. The Corps was ready to move ahead with construction, but many fish scientists were concerned about the effectiveness of fish passage at Bonneville Dam, then nine years old. The committee convened its hearing on the Snake River dams in Walla Walla, Washington, on June 25. More than 200 people attended, and the testimony was fairly evenly spilt -- a few more people testified against the moratorium than for it. Those speaking in favor of the moratorium included lower Columbia commercial fishers and mid-Columbia Indians. "Why spend the taxpayers' money for unwarranted reclamation and navigation projects before a fish program is fully guaranteed," asked Henry Niemela of the Columbia River Fishermen's Protective Union, a lower river association of gillnetters. Similarly, Chief Tommy Thompson of the Wyam Tribe, a resident of the Celilo fishing village near The Dalles, Oregon, testified, "I think I don't know how I would live if you put up a dam which will flood my fishing places ... how am I going to make my living afterward? It is the only food I am dependent on for my livelihood, and I am here to protect that." But government witnesses opposed a moratorium because the region's population and economy were growing and new sources of electricity were needed. Roy Bessey of the Interior Department's Pacific Northwest Coordination Committee made that point at the hearing. A month earlier Warner W. Gardner, Assistant Secretary of the Interior, wrote in a letter to the committee that "the salmon run must, if necessary, be sacrificed," adding: "The government's efforts should be directed toward ameliorating the impact of this development upon the injured interests and not toward a vain attempt to hold still the hands of the clock." Later, a subcommittee of the main body interviewed a number of experts on fish and dams on the question of impacts to fish and concluded there was a "plethora of opinion" and also a "paucity of fact." In September, the Committee recommended against the moratorium. Through the 1950s, state fishery officials did not object to all dams, only those like Mayfield and Mossyrock that were proposed for sites where the potential damage to anadromous fish runs would be the greatest. In June 1950 John Hurley of the Washington Department of Fisheries wrote to J.H. Cellars of the Columbia River Packers Association that the four dams proposed for the lower Snake River would "... create some of the most expensive electricity in the United States" because of the impacts on salmon and steelhead. The following year, in July 1951, Robert Schoettler, director of the fisheries department, wrote to Washington Sen. Kenneth McKellar noting that "there are 387 dam sites that are undeveloped in the Columbia River Basin" and "these sites are capable of producing between thirty and fifty million kilowatts of hydro-electric power." Only a small percentage of these sites "... are objectionable from a fisheries standpoint," Schoettler wrote. Specifically, the Department opposed the "fish-killing dam" proposed at Ice Harbor. Oregon's fish and game commission also openly criticized plans for Ice Harbor, and for the same reason. At the same time, the Atomic Energy Commission supported Ice Harbor, and the manager of the federal government's Hanford Works, concerned that the Bonneville Power Administration might not be able to meet Hanford's growing power need and the growing needs of the Northwest, suggested that the dam could be the exclusive power source for the Commission at Hanford. To this, Schoettler, responded in a separate letter to Sen. McKellar: "Any Pacific Northwest Power shortage that now exists is not the product of the salmon problem but a result of the power agencies failing to develop non-controversial sites while ignoring the pleas of the fisheries people and the general public." Fishery interests would use the fish passage issue to delay the beginning of construction of the first of the four Snake River dams, Ice Harbor until 1957. Congress authorized its construction in 1955. Elsewhere on a smaller scale the same concerns were being expressed in efforts to stop dam construction. One of the key public battles was waged over plans for dams on the Cowlitz River in southwest Washington. In 1949, as the plans for the Snake River dams were being attacked, a survey of Columbia River tributaries by the U.S. Fish and Wildlife Service identified the Cowlitz as a potentially important salmon-bearing stream that should not be developed for hydropower development. However, as many as five dams were under consideration for the river. Tacoma Power, the municipal utility in that city, proposed to build two power dams, Mayfield and Mossyrock, the Bureau of Reclamation proposed to build an irrigation dam on the Tilton, a Cowlitz tributary, and the Corps of Engineers identified the Cowlitz as a possible site for two multiple-purpose dams. Both rivers had large salmon and steelhead runs. Fish advocates including state and federal fish and wildlife agencies and associations of commercial and sport fishermen opposed the dams. The part of the survey that included the Cowlitz was prepared by Floyd Bryant, an aquatic biologist with the Service's Branch of Fishery Biology. Bryant wrote that the Cowlitz, the second-largest Columbia tributary downstream of Bonneville Dam, flowed through a deep canyon not well-suited to large-scale agriculture. The population was not large, and because new dams were contemplated for construction upriver in the Columbia basin, there was little need for dams on the Cowlitz or its tributaries, he concluded. He expected strong opposition to the dams. "The Cowlitz River system may very well be one of the future top-ranking salmon and steelhead breeding areas in the country," Bryant wrote. The future was bright, he said, because most of the watershed already had been logged, trees and vegetation were growing back, and so habitat impacts should be minimized in the future. Tacoma, which was spending millions of dollars a year to buy power, mainly from the Bonneville Power Administration, fought aggressively for the right to build the two dams. Opposition from the Legislature, the Washington Department of Game, and sport fishing groups was strong. The Legislature took the extraordinary step of declaring a salmon sanctuary on the Cowlitz in an attempt to block the dam, but the city fought a protracted legal battle that went to the U.S. Supreme Court three times before the city finally prevailed. Construction of Mayfield Dam, which began in 1955, was halted for two years while the lawsuits took their course. Mayfield was completed in 1963 and Mossyrock, 13 miles upriver, in 1968. Tacoma agreed to mitigate the fish losses through construction of two hatcheries, one for salmon and the other for trout. The hatcheries are operated jointly with the Washington Department of Fish and Wildlife. Hydropower dams always have been seen as essential to economic progress in the Northwest, and fish always have been in the way of progress. That is, the mere presence of fish that would be affected by dam construction and operation was not enough to halt construction, at least of the biggest dams. Some contrivance or contraption, from hatcheries to fish-passage facilities, always was considered adequate to mitigate the impacts so that progress would not be stalled. The underlying problem however, is the failure of existing authorities to give appropriate consideration to the conservation of natural salmon and their habitats in decisionmaking. In the Pacific Northwest, development has often proceeded with the assumption that improved technology or management would mitigate impacts on natural salmon stocks. The region's reliance on alternative and uncertain mitigation schemes (as opposed to following fundamental conservation strategies) has been a costly approach, both for natural salmon and for the public. In a 1995 article about salmon and dams, High Country News interviewed Floyd Dominy, 84, who was commissioner of the Bureau of Reclamation during the dam-building frenzy of the 1950s and 1960s, and then-current commissioner Dan Beard, who was known for his anti-dam leanings. Dominy, who clearly believed dams were more important that fish, commented: "Now, I'm sure people can survive without salmon, but I don't think they can survive without beans and potatoes and lettuce. . . .I think the [salmon-blocking dams were] worth it. I think there's substitutions for salmon. You can eat cake." Beard clearly had a different opinion. He told the newspaper that the problem of dams and salmon in the Columbia River, and the difficulty of rebuilding salmon runs there, was "the most complex natural resources problem in America today. Nothing else approaches it."